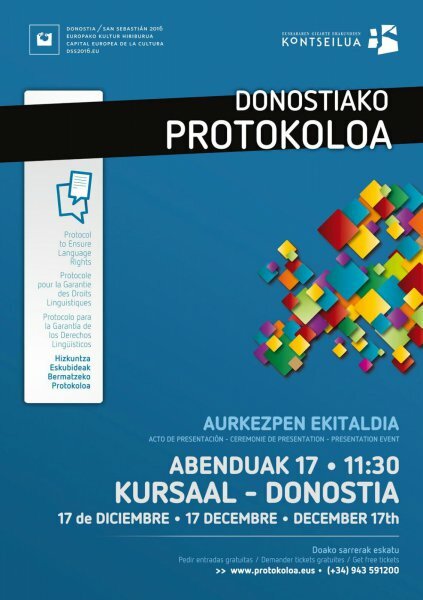 On 17 December 2016 the Donostia Protocol, finalised by a committee of organisations including the Unrepresented Nations and Peoples Organization (UNPO), the Council of Social Organisations of the Basque Language (Kontseilua), Linguapax, the European Centre for Minority Issues (ECMI), PEN Translation and Language Rights Committee, the European Language Equality Network (ELEN) and the Centre Internacional escarre per a les Minories Etniques i les Nacions (CIEMEN) will be released and presented to the public in Donostia – San Sebastián. The Donostia Protocol, which will conclude the extensive programme of Donostia as European Capital of Culture for 2016, will be sent to international organisations to work as a guideline to ensure language rights for minority and regional communities in Europe and beyond. The Secretary-General of Kontseilua, Paul Bilbao Sarria and the CEO of the Donostia - San Sebastián 2016 Foundation Pablo Berástegui Lozano are pleased to invite you to the presentation event of the PROTOCOL TO ENSURE LANGUAGE RIGHTS on 17 December at 11:30 a.m. in the Chamber Hall at the Kursaal Palace. Language rights must be considered as a basic human right. Languages are for communication, but cannot only be perceived as a vehicle of communication, since languages are intrinsic to culture. When the connection between languages and cultures is denied, the rights of the citizens are not considered. Thus, supporting linguistic diversity works as defending peoples’ rights. This will also open up a channel which can contribute in ensuring social well-being and peaceful coexistence, because working towards the democratic treatment of language communities is one way of ensuring that all human rights are respected. Throughout Europe, linguistic communities have taken steps to enable people to live their lives in their own languages. There are hundreds of community-based organisations acting in different fields with the goal of supporting minority languages. The project of the Protocol to Ensure Language Rights, the Donostia Protocol, proposed to create a meeting place where European civil society can take charge of the process of nurturing European linguistic diversity. This project will be the beginning of a process undertaken by social entities, non-governmental organisations and specialists to establish a new proposal to ensure language rights collected in the Declaration of Human Rights. This document has the ambition to be a tool accessible to civil society across Europe. The Protocol to Ensure Language Rights (PELB) is the outcome of a series of discussions over preceding years by numerous groups; an instrument that brought together scientific perspectives, academic opinions and social viewpoints; and a novel foundation for building a new Europe based on equality between language communities. Therefore, the Protocol, which emerges from the project, will be taken to the international fora and institutions to allow entities of all kinds to use it to regulate their commitment to language diversity. The project was presented in five major Basque cities, and five different workshops were organised to study issues in different sectors, with around a hundred participants representing a variety of fields. This led to a phase of more intensive work through specialized sessions involving representatives of labour interests, the media, education, technicians, actors, writers, cultural figures, leisure activity organisers, trade unions, academics, information and communication technology experts and others. The project was presented all over Europe with visits to Catalonia, Galicia, Ireland, Wales, Friesland, Flensburg, Brussels, Asturias, Norway and Estonia, with presentations elsewhere via video conference with entities in Sardinia, Corsica, Brittany, Scotland and Friuli. The organisers included more than 400 contributions from civil entities involved supporting minority languages throughout Europe. A Scientific Committee added the final touches to the text of the resulting document, which is to consist of approximately 185 specific measures. The organising committee has finalised the text of the Donostia protocol and ratifications from social entities are due before the ceremony of presentation in the Basque Country, Donostia-San Sebastian 2016 European Capital of Culture in the Kursaal Palace on 17 December. The 17 December is going to be a new step forward on the road to peaceful coexistence of different languages. At the Kursaal Palace, Europe will receive from its social entities a Protocol to Ensure Language Rights, an effective tool to fulfil the rights of all linguistic communities in Europe, an effective tool for the development of minority languages.